and then back to pink. It does this all night long. It's really pretty. I can't wait to see it in the snow. It will look pretty in the snow, too. Believe me, I can wait! I like getting chummy with Mom. Each night this week I've made her sit in the big chair, and then I jump up and lie down next to her for pets and scritches. She's been tippy tapping on her silver lapbox. She found her butterfly book, but she said she didn't need it anymore. Guess after yesterday's blog post you can figure out why. Last night she was looking for different stuff on the innernets and then she did some little drawings in her sketchbook. She says she's doing research for her SSP. That and she started up a quilting blog. Goodness gracious! I made sure she understands that MY BLOG is the MOST IMPORTANT one, and that she HAS to help me post EVERY DAY. Sheesh! I used to think life was tough as a feral kitty. But it sure is a lot of work to train your bean. I guess the regular food, clean water, nice safe place to sleep and Temptations treats and regular scritches make up for it. Anyway, we have added a countdown clock to the top of my blog for the reveal of the Super Secret Project. Mom says it will be "big." Update -Please let me know if the clock isn't working! And she updated the look of the Bizzy for Gizzy blog. 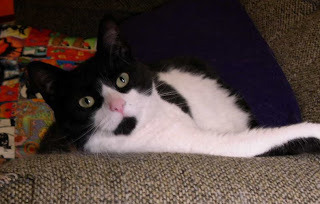 She put up a really nice picture in the banner and added a picture of Gizzy and a link to the story of how the Gizzy Quilts came to be. Any cat with a Gizzy Quilt who has not posted their pictures should contact me for instructions on how to post their own stories. She started a Quilting Blog. It's called The Patchery Menagerie, and she stayed up SO LATE working on it, she didn't even have time to help me post a T13. It was nice and warm over the long weekend. Mom had the window open while she worked on the Super Secret Project (SSP). She has been working on the SSP practically non-stop, so the kitchen is full of dirty dishes and she didn't even do the laundry or change the sheets on her bed. She is really happy with her progress on the SSP and she is exactly where she wanted to be by the end of Monday. She went to The Mall with Auntie and PlusOne. She came back with a jacket, a blouse and two pairs of shoes. She said these were for the "trip in Joo-lye." Skeeter, LC & Ayla: it has nothing to do with a ferry or the number 260, though "Maryland" does appear to be correct. Monty Q, honey: the color isn't pink. Yes, the trip is in "July," which isn't so far away. 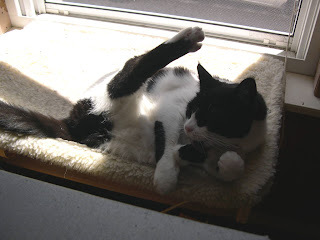 P.S., go see Roxy's blog today if you want a good laugh. 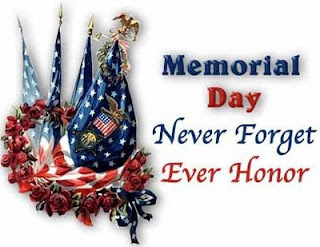 Mr Karate's dadbean served in Viet Nam, so we are very aware of the sacrifices our Military Men and Women make on our behalf. 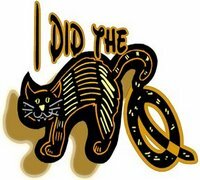 Yes, Poppy Q, we did watch Scott Dixon win the Indy 500! You Kiwis must be celebrating big time! Mom spread the dirt around in pots yesterday, and stuck lots of stoopid green leafy plants in them. Here's a picture of some of them. Fiona bun knows what this stuff is (that is, if she's still conscious), but I'm pretty sure it's Dill, Marjoram, Sage, Purple Sage, Red Leaf Lettuce and then down front it's Oregano, Savory, Globe Basil and Basil Perpetua. There's also Parsley, Mint, Golden Oregano, Chives, Cilantro and my 'Nip (but that's on the porch so no other cat can have it but me.) Then she spent most of the day working on the Super Secret Project. Mr Karate came over and this was what Mom made him for dinner: Yes, that is HIS plate! Sorry about the blurry areas in the picture. That's because Mom stuck her greasy finger on the camera lens. To all of you who have the mistaken idea that the house is always NEAT, let me assure you that is not the case. When Mom does nothing but work in the sewing room, the rest of the house goes to pot. I'm taking it easy today. She's out buying dirt. After that she's going to watch metal machines drive around in a circle. Need I say more about the weirdness of beans? Mom has to go day hunting today. It's the Month End gig. She has been working on the super secret project. And I sat down in the middle of it! She took a picture, but she won't post it. I -can- tell you a little bit more about Joo-lie. It involves a Train and Mary Land, the numbers 26 and 10, and a color. And something about a Fairy. But that's all I know, and it doesn't make any sense to me either. When Mom goes for a walk in the mornings, she brings her little camera and she takes pictures of the weirdest things. Dunno what she thought was interesting about this particular scene, but I just show it as an example of how odd she has been since she started working on this super secret project. I -finally- found "it". The perfect napping spot. The best things in life are often the simplest. 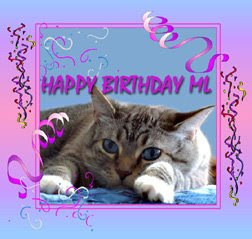 And to a very special Friday Friend: Happy Birthday ML! 1. I really really really like my Temptations treats. 3. Mom didn't work on her super secret project tonight. She stood in the sewing room looking around, but didn't actually do anything. Go figure. 4. Mu Shue, Lilly Lu & Iris got their Gizzy quilts yesterday. Mama Laura said Mu Shue helped her open the box, and claimed his quilt right away. Lilly Lu and Iris loved their quilts too. 5. Mom had bought some ham-micks from 40 Paws for Roxy and Lucky and Missy, but the woofies didn't appreciate them, so Mom and I got them back, and then sent them to Parker. 6. I think I would have liked to keep them, but Mom said four ham-micks is too many for one cat, but one ham-mick is not enough for four cats. I made sure to leave my special stink on each of them. 7. Mom talked to Mr Karate tonight about somebody making sure to feed me for a week in Joo-lye. I do not know what this is all about, and I am very suspicious. 8. Mom has been looking for her book with pictures of butterflies. She can't find it. So she spent some time tonight looking at pictures she found on the innernets and drawing some in her sketchbook. I do not understand this at all. 9. Mom has received the special video card for her computer, but she still hasn't put it in yet. 10. Mom wants to buy more dirt this weekend. I do not understand why beans pay green papers for dirt you can get anywhere. Mom says she buys "good" dirt. This means there is also "bad" dirt. I'm not going there. 11. Poor Monty Q. First Sprout hijacks his blog, then his MomBean posted a picture of his toes. How humiliating! 12. I do not jump much, so I don't know if I will enter Kimo & Sabi's jump and shout contest. 13. I still haven't found "it" yet. But one block away from that arch, is this one. You are looking in the opposite direction, down toward the rest of the city. You can really see how our neighborhood is higher. So that must be how the arches in our neighborhood got the name "Rimmon Heights." Me, I'm still looking for "it." I am watching Mom make a mess again. I don't think she knows what she is doing. Usually she is so organized and so neat. But she has fabric thrown all over the place. She doesn't even fold it to put it away. Half the time she sews two pieces together and cuts them apart AFTERWARDS. Usually she knows -Exactly- what she's going to do. Usually she has a Plan. She says she's going by the seat of her pants, but I know she's lying. She hasn't cut up her pants yet. I think she's losing her mind. HAHAHA! Mom says I can't tell anything about her Super Secret Project, but she can't prevent me from showing the big mess she is making while she works on it. She is using every single color of fabric in her stash. Reds, Oranges, Yellows, Blues, Purples, Greens... She's even got some Brown (and she hates brown.) She's got big pieces, little pieces, really funny shaped pieces... And there's bits of thread all over the place... She's got all kinds of special rulers. She has pictures of ideas, and she has what I call "Destructions." PS, the quilts for Lilly Lu, Mu Shue & Iris will be picked up by the man in the bloo shorts today, so they will have them real soon. One of us knows how to take it easy on a Sunday Morning. The other one doesn't. I'm not giving away any hints, but I bet you can figure it out. Yesterday I got a little package in the mail from my dear friends, Skeeter, LC & Ayla and their Big Thing. They had read about how Mom had planted a whole lotta stupid Basil, but no 'Nip. So they sent me some! 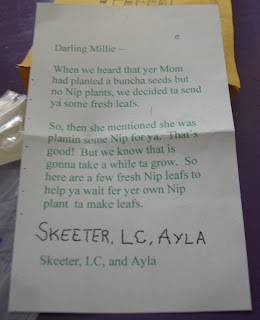 This is the letter I got with my 'Nip: Isn't that sweet? So is the 'Nip, I gotta tell ya. I sniffed it, ate it, and rolled around in it. But she -also- bought this: My very own pot of 'Nip. Mom says it will grow real big, and I can have 'Nip leafs whenever I want. I guess Mom is pretty cool after all! Thank goodness it is Friday. I am looking for something. Maybe it's over there? Where did it go? Just like this week. Where did it go? OK, here's the story of how come this post isn't about me: Last night was PlusOne's ceremony to get his Black Belt in Karate. Mom had to rush home, change her clothes and feed me, then go out to watch PlusOne. Then she came home, made dinner, got a little bit of sewing done, then had to leave again to pick up Mr Karate and drive him and his bicycle 18 miles home (because his car is in the shop being fixed.) So she missed two of her favorite TV shows (one is Top Chef) and she didn't get hardly any sewing done. She drove Mr Karate home, and he remembered he forgot his Orange Juice at Auntie's. So Mom drove him to the grocery store so he could get some stuff to eat for breakfast and lunch. Then she drove him back to his place, and then she drove herself home. 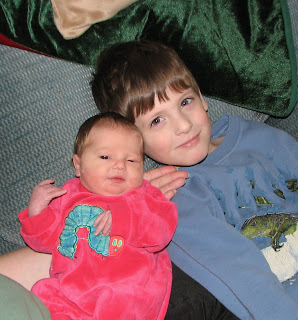 So instead of some nifty post about me, you get to see something else (sigh) that Mom had ready for another time. Mom is from New Hampster, and as such, she is a wimp when it comes to hot foods. So instead of using hot chili powder for stuff, she uses Emeril's Southwest Seasoning. She ran out recently, and had to mix up another batch. 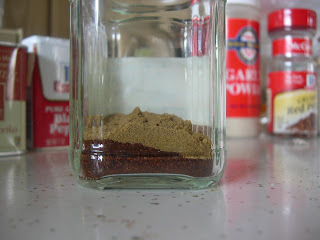 So this Thursday Thirteen is about making some Emeril's Southwest Seasoning. 1. You need a clean jar that will hold a little over 1/2 cup. This is a clean jelly jar. 2. Add 2 tablespoons chili powder. Use hot, mild, or whatever you like. 3. Next add 2 teaspoons of ground cumin. Mom gets a lot of her spices in bulk at the local Indian food store down the street. 4. Add 2 tablespoons of paprika. Mom has some smoked paprika called Pimenton de la Vera. 5. Add 1 teaspoon of ground black pepper. 7. Now add 1 teaspoon cayenne pepper. 8. Add 1 tablespoon garlic powder. 9. Now add 1 teaspoon crushed red pepper. Or more if you really like things hot and spicy. 10. Add 1 tablespoon salt. 11. Last, add 1 tablespoon dried oregano. Mom used some Mexican Oregano from Rancho Gordo. 12. Now mix it all up until it is well blended. It will look like this, on the right. Kinda boring, which is why when Mom gives this mixture as gifts, she leaves it like the "sand art" on the left. 13. And here's a fuzzy picture of the recipe. Mom uses this stuff in Chili, on Macaroni & Cheese, in Deviled Eggs, in Scrambled Eggs, in rice, in soup, on chicken, or on or in anything that needs a little kick in the patootie. Naturally I never touch the stuff.